North (I think) should have been sin binned for slapping the ball away when Strettle could have scored a try. Around 77 mins I think. Ireland also had a good result but were flattered by the score line. Deffintley one of Jonny Sexton’s best games in Ireland jersey. haha, what? They competed for the ball and he pushed it into touch backwards, no knock-on and not even a scrum let alone a penalty. It is same old, same old in England this morning. The ref got it wrong, the touch judge got it wrong, the video ref got it wrong. England got a lineout 5 metres from the Welsh line—they had several in the match—and couldn’t score, deal with it. In that case it is no surprise he doesn’t know the laws. Ireland are the biggest cheats in world rugby. No we’re not. And if I can remember didn’t Wales cheat to beat us last year in Cardiff. Is there a team in sports anywhere that doesn’t have a list of “we wuz robbed” stories? One of the things that makes us so proud of this Welsh team is that they have had so much rub of the green go against them in recent seasons and they just say “we have to get better”. Surely the best cheats know all the laws and know how to bend them? I am assuming you are a rugby follower mate? Ireland do exactly this, at regional and national level, and it is very well known, not just my opinion. It wasn’t particularly a criticism—they are kind of respected for it—it is just that if you live by the sword then you should be able to take it when it goes against you. Here is a quote from Morgan Parra of France which could be backed up as many times as you want really. Sorry about the knobend bit. I thought the sweeping statement was based upon nothing more than a strange and feisty personal view. I have never heard this before but a quick google has enlightened me to this view, and how very strange it is. You have to be very careful about banding about slurs about cheating and I’m surprised its gone unpunished. How has anyone got away with this? I’d probably look a bit further into it but Parra doesn’t exactly explain very well. If he offered up at least one example of when Ireland cheated in a particular video then maybe it could be looked further into. But he doesn’t. You could change the word ‘Cheat’ into the word ‘Bake’ in that quote and it would make just as much sense. No worries mate, I could have expressed myself better. If you go back a bit New Zealand used to have the “cheat” tag, and in the 1980s Scotland had it. (c) because their scrum is no great shakes they collapse it when they win the ball or wheel it when they don’t to mess up the opposition ball. If you went through yesterday’s game I am sure you could find “bad” calls against Wales as well. I could give you two off the top of my head, including the yellow card, but moaning about it after the game doesn’t get you anywhere. Ernst Joubert after Saracens v Ulster ... Not sure, but I think it might be broken. Toulon - Clermont in the Heineken Cup final right now, apparently balanced so far. Great second half with a gripping end, Toulon wins with just one point over Clermont. They might might again in the Top 14 final, on June 1st (semifinals to play). Wilko interviewed in French, he is about >>>>>>>>> (multiply this by 100) >>>>>>>>>>>>>>>>>> Joey Barton. Was flicking between this and the cricket. Cracking finish I didn’t think they were gonna hold on. Claremont are idiots. Not sure if many care about the Lions Tour, but i just scored a ticket to the match against Australia on Saturday. It’s at the Suncorp next door, tickets are sold out but managed to grab one and being dropped off to my house tonight. Feels pretty damn good. ^ that should be an excellent evening, enjoy. I’ve listened the 5 live special on the tour and the pundits said you have a good chance of winning the first two matches against Australia. I watched New Zealand - France and it was very good (albeit there’s no beating New Zealand). How long until the Lions tour is 6 Nations v. Four Nations? Was going to ask you how it is to be an Irishman in Oz at the moment with the Lions Down Under? The tour is getting a massive promo push over here, mainly ‘cos Sky have it so it’s dominating a lot of SSN & the Sports Channels. Did anyone see the 1997 Lions Tour documentary they’ve been showing on Sky? It was incredible. It’s about 3-4 hours long, no narrator, no talking heads, just a camera in amongst the group as if you were actually part of the team. They had unprecedented access to the players, filming them psyching themselves up before the game, being there when players were told they were injured, their training, the selection process, following the managers during the game rather than the action. It was utterly superb. Here’s the forward’s motivational speech before the first test. Fantastic stuff. It’s pretty incredible to be honest. I live right beside the Suncorp Stadium, so basically on the main strip of pubs and clubs at the stadium. Brisbane is being dominated by this Lions game right now, the city is full of Lions fans. It looks as though a lot have travelled from the UK and Ireland for this which is quite extraordinary considering the length it takes to get here. Australia take it very seriously, a lot of them hate us when it comes to sport. They really want to win this. I was at one of the warm up games when Lions played the Queensland Reds, was a good atmosphere, but Saturday will no doubt top it. Shame that our national anthem won’t get played before the game, would be an emotional occasion for a lot of Irish out here who have had to move away from home. They are talking of scaling the tours back, but from what i can see this is a massive revenue booster for hotels, bars, stadiums all around Australia. It really has ignited the place and i couldn’t think of a much better way than my second last weekend out here than to watch this game. Will take some pictures of the atmosphere, street, stadium and post them in a thread if anybody is interested? Premiership my arse. All about the Rabo. Hopefully they’ll lose Friday night. I’m going to see Connacht play them in the Heineken Cup. Anyone else watching England - New Zeeland? Started as a field day for the ABs but finally there is some English response. Just watched it from this afternoon. Cracking game but in the end the All Blacks just that bit too good. 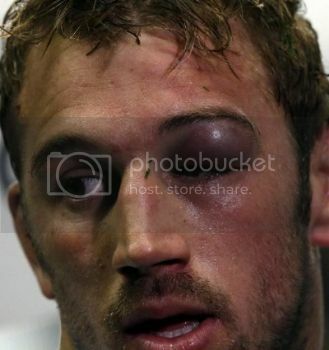 Robshaw played with that for at least 30 minutes that I could remember. Romania beat Canada by one point with what was literally the last kick of the game. Proper #scenes at the end of it, better than after Senegal - Ivory Coast. One test left to win against Fiji (the first was Tonga) for what will have been a tremendous autumn. Ireland were poor tonight. The amount of unforced errors was ridiculous and a team as strong as the Wallabies were always going to punish that regardless of form. Next up we only have the All Blacks to play. Some interesting calls to be made with Sexton’s injury. Schmidt may bring D’arcy back in because of it even though Marshall had some bright sparks tonight. He’ll be some player in the future. France - South Africa, Scotland - Australia and Romania - Fiji tomorrow; and Ireland - New Zealand on Sunday. Anyone else just watch the extended highlights of the 2003 final on ITV? It was a lot scrappier than how I remember watching it as a 9 year old. 10 years on from England’s Rugby World Cup win in Sydney coach Sir Clive Woodward gives a unique insight into that dramatic final against Australia. Woodward watches the final back in full for the first time ever and records his thoughts and emotions as the drama unfolded. He explains the reasons why certain decisions were made and the planning and execution of the winning drop goal by Jonny Wilkinson. Using Ian Robertson’s legendary commentary as a soundtrack, Woodward takes us on his journey from kick-off to the moment when Martin Johnson lifted the William WebTb Ellis trophy. Some of the commentary used is amazing, looking back. HE DROPS FOR WORLD CUP GLORY. IT’S OVER! HE’S DONE IT! Goosebumps. I’ve seen that match back then, even if I wasn’t understanding much. 10 minutes left until hopefully the first ever Irish win over the all-blacks, tune in if you haven’t already! Bah. Gutted for the Irish. Extraordinary match, easily the best I’ve ever seen. Brilliant performance from Ireland who really should have won. Hopefully it won’t be a once off but I wouldn’t count on it. I think the past two games have shown we are a good side just woefully inconsistent.